Switch to the left is off, toggle to right open it, the product uses stepless speed, free choice of wind speed. Low wind speed can be used for about 3 hours, high wind speed can be used for about 2 hours. The maximum distance of bottom clip is 60mm, sutable for all kinds of edge, let you easy to use and release your hands. Can be charged by any USB outputs, like computer, power bank , and mobile phone's adapter. Please full charge it when you first time to use it, the charging voltage is 5V-1A, charging time is about 3-4 hours. When charging, the indicator light is on and full is off. ♥ PORTABLE AND EASY TO USE: This lightweight fan is easy to transport and a breeze to use. And set the fan up alongside your infant to watch them cozily and comfortably nap away long summer days. ♥ HIGH QUALITY:This clip fan is made of top adopted ABS plastic and silicone material, environmental-friendly, easy to clean and durable to use for a long time. ♥ FLEXIBLE NECK AND STURDY CLIP: Whether it's a car seat, a stroller on the move, or a crib at home, the Stroller Fan employs a flexible neck and stout clip, allowing the fan to keep your child cool no matter the surface or angle. 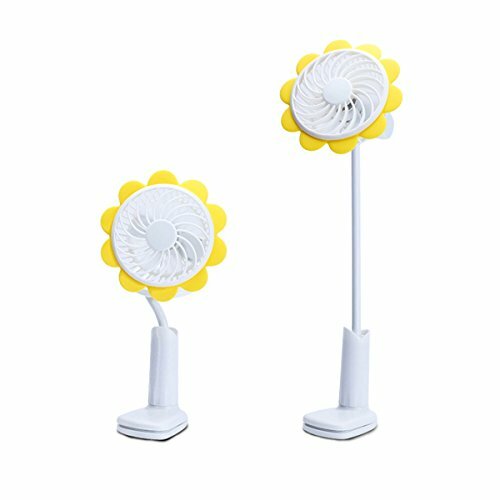 ♥ CHARGE POWER:With built-in high capacity rechargeable battery for a long lasting performance use and you could charge the fan with included USB cable, connecting it to the USB port, such as computer, laptop, mobile charger and so on, really convenient to use. ♥ EASY TO CARRY:Light weight and portable desig with a compact size, the fan head could be taken down from the gooseneck, easy for you to carry when indoor or go outdoors. Can be packed in a beach tote, casual handbag or shoulder bag. A nice gift for yourself or beloved friends. You canot miss it! If you have any questions about this product by Bwinka, contact us by completing and submitting the form below. If you are looking for a specif part number, please include it with your message.